Welcome to Camp Cobark, located at the foot hills of the world heritage Barrington Tops. Camp Cobark is one of the oldest family farms in the district. Located 40km West of Gloucester, Allen & Dianne Shultz have created a nature lovers haven. Offering Horse Trail Riding, Camping, rustic style amenities. Camp Cobark offers you a peaceful, stress free environment to do things you have never done before. Enjoy a swim in the pristine Cobark River, Explore the foothills of the World Heritage Barrington Tops on horseback. Camp on one of five riverside campgrounds along the Cobark River or sleep under the stars in a swag. Camp Cobark is a short drive to all the conveniences of the Gloucester township. The world heritage parks of Barrington Tops are close by and make the perfect day trip for your camping holiday. Come and Experience Camp Cobark’s special brand of hospitality. Allen & Dianne are the owners. 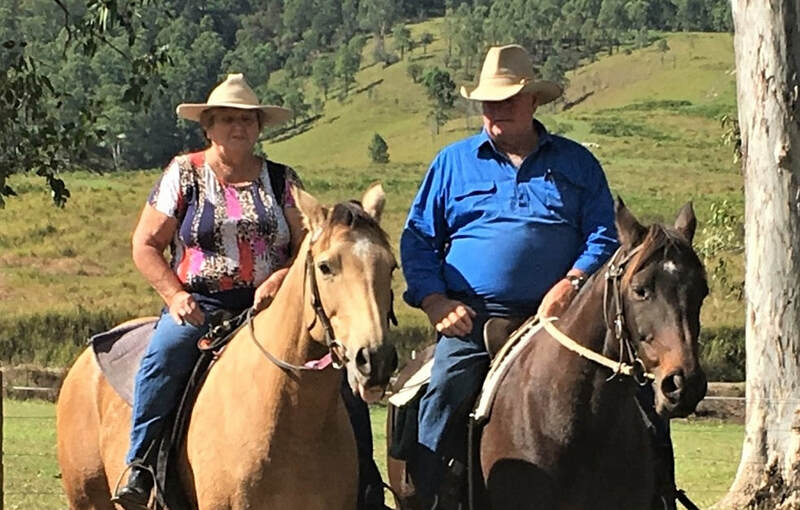 They opened up their beef cattle property to show their love for horse riding and the country experience. Their children and grandchildren all share this passion and want to share it with you. ​Paul looks after the horses to ensure they are ready for you to ride. Sal is the daughter of Allen & Di, her love of kids and horses makes her the perfect Camp Mum who cooks and takes care of individual needs.